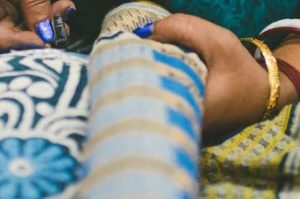 Khushi Hands is a community interest company (CIC) which sells beautiful artisan products hand-crafted by underprivileged women living in Kolkata, India. The women who hand-craft the products we sell are employed at vocational training centres in Kolkata. These centres provide young women from slums with training and job opportunities. As well as being trained in tailoring and paper crafts, the women are taught English, business skills and values for life. The women, while being paid for their craft work, are increasingly self-sufficient. Their self-esteem and dignity are built up and they are empowered to begin to improve the quality of their lives. You can find out more about Khushi Hands here. Khushi Hands is also linked to Khushi Feet, a registered charity which raises money for schools for street children in Kolkata. Please visit our website to find out more! For sales enquiries, or bulk sales, email admin@khushihands.co.uk. If you like the look of the items on the site but want to enquire about a specific or different colour, do get in touch as we often have more stock than is online. Most of our sales are done at festivals and markets, and if you are holding an event that you think might benefit from a Khushi Hands stall, we would love to hear from you.